When it comes to helping you make sense of technology, The Little Guys events are the place to be. Our events serve to inform, educate and excite you about the possibilities that technology delivers for you, your life, and in your home. Whether you are looking for technology to bring the family together, to create new spaces, or simply have more fun, you can learn about the possibilities at The Little Guys events. To make sure you get an invite to our next event, please complete this form. Guest speakers and demonstrations include factory representatives from Sony, McIntosh, Furman, Bluesound, Sonus Faber, and Golden Ear. Learning sessions for distributing music throughout the house easily and at a high performance level. 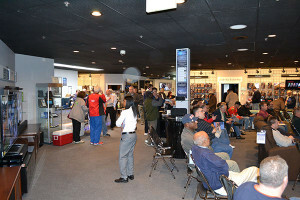 The 21ST Century Home Entertainment Technology Event – Topics discussed and products demonstrated included Networks, Control Systems, 4K Video, High Performance Cables and Wiring as well as Streaming Music demonstrations. Live in store presentations of the latest speaker technology combined with the most advances Dolby Atmos surround demonstrations by industry icon Sandy Gross. 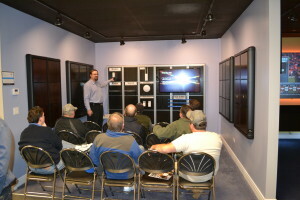 Factory Reps demonstrating Music Storage from BlueSound. A general session discussing the “state of technology” led by Tom and David from The Little Guys. Go to iTunes and subscribe to our podcast!